Since February is a short month, I’ve chosen this quick-to-make, scrappy block for us and if you happen to have some 3 inch (finished size) 9-patch blocks at your house, you’re almost done. When you post your blocks, use the tag Alt-9P for your blog post. Your 9-patch units can be made from your choice of fabrics, as long as the darker fabric appears in the corners (and center). Add to it a Light and a very Dark square. You can make a maximum of 9 blocks for the February drawing. 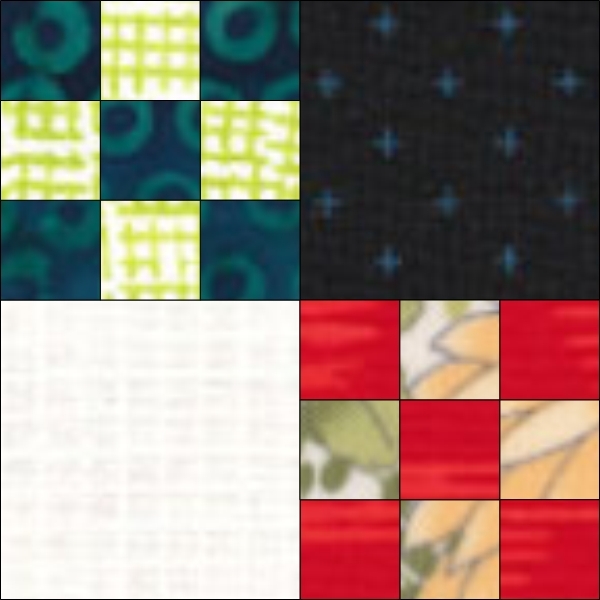 As soon as you make a few of these and start playing with them, you’ll see that the layout possibilities for a happy scrappy quilt are endless. I’ve included one in the block directions download. I hope everyone will share their ideas, along with their blocks this month. Am I the only one who is getting a message of “cannot open the page, URL can’t be shown” when clicking on the blue link? Thanks for letting me know. I believe the link is fixed now. Thanks so much, Sophie. My link automatically downloaded, nothing to do. =) It’s an intriguing idea. A perfect block for the shortest month of the year! They will make a great quilt!